Explanation: In spiral galaxies, majestic winding arms of young stars and interstellar gas and dust rotate in a flat disk around a bulging galactic nucleus. But elliptical galaxies seem to be simpler. Lacking gas and dust to form new stars, their randomly swarming older stars, give them an ellipsoidal (egg-like) shape. Still, elliptical galaxies can be very large. 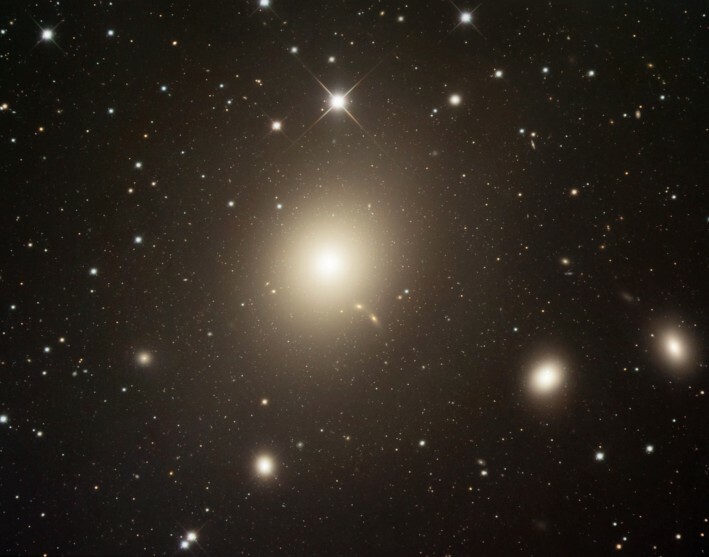 Over 120,000 light-years in diameter (larger than our own Milky Way), elliptical galaxy M87 is the dominant galaxy at the center of the Virgo Galaxy Cluster, some 50 million light-years away. M87 is likely home to a supermassive black hole responsible for the high-energy jet of particles emerging from the giant galaxy's central region.